I have a 96 2.2 Base Beretta and am debating on installing dual exhausts on the car. I was just wondering if anyone could tell me the best way to go about this. Do I just buy a cat back pipe and flip it over so it is the opposite the other and hook it to a y pipe off of the converter? Any ideas suggestions anything? why would u split it after the muffler?? would the gas tank filler tube get in the way?? 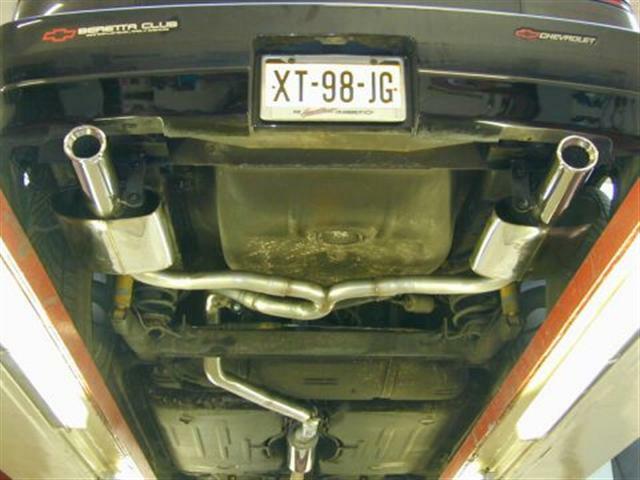 What he suggest is similar to the Camaro setup where there are two tip out of a single center muffler. I'm doing a dual dragger setup soon (for look and a non existent sound )and the way to do mine is to split it using Y-separator after the rear axel(?). Of course i'll need a new exhaust hanger for the right side but they are available. Hey it can be done with a little bit of good craftmanship. This is my 2.0 with a dual stainless steel setup. how does it sound, Gert? The underside of you car looks VERY nice. I'm impressed at how well you've kept the rust down on the suspension parts and rear axel. what kind of mufflers do you have on their Gert? I also have a setup similar to Gert's, but I did mine myself so it doesn't look as nice as his. I don't have any underside pics like he does, but I do have a rear shot of the car. BTW mine is a straight pipe setup. Is that for the 2.2 or 2.0? Nice sound. I don't think the recording did the setup justice because it kinda borders on that ricey sound. There's actually more burnout than what's shown... I went back and measured it... it was 60 some feet long. That was back when I had my old crappy tires, I doubt I could do one that long with my new ones.